Explanation: If you saw the dawn's early light from Cape Canaveral Air Force Station last Friday, June 29, then you could have seen this rocket's red glare. 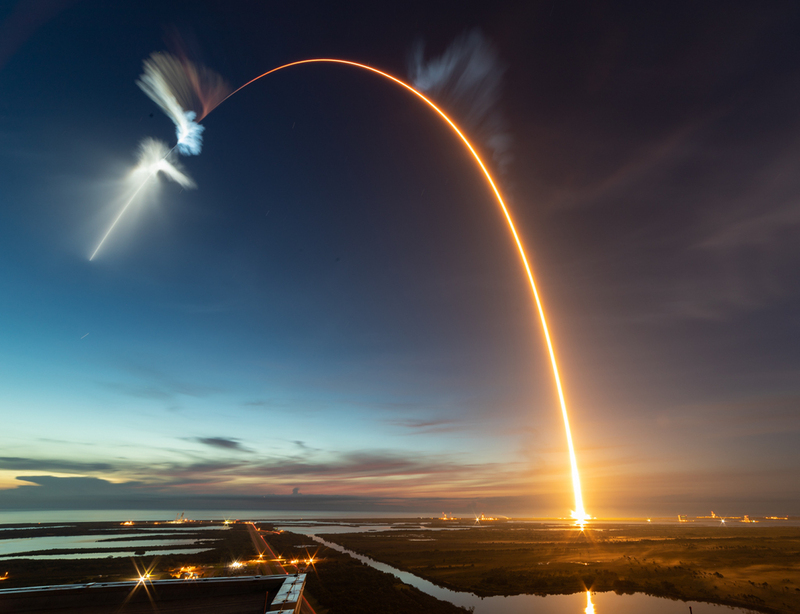 The single 277-second long exposure, made from the roof of NASA's Vehicle Assembly building, shows a predawn Falcon 9 launch, the rocket streaking eastward into the sky about 45 minutes before sunrise. At high altitude, its stage separation plume is brightly lit by the Sun still below the eastern horizon. The Falcon 9 rocket's first stage had been launched before, lofting the Transiting Exoplanet Survey Satellite (TESS) into orbit on April 18, only 72 days earlier. For this launch of SpaceX Commercial Resupply Service mission 15 (CRS-15) it carried an also previously flown Dragon capsule. But no further reuse of this Falcon 9 was planned so no dramatic first stage landing followed the launch. The Dragon capsule arrived at the International Space Station on July 2.